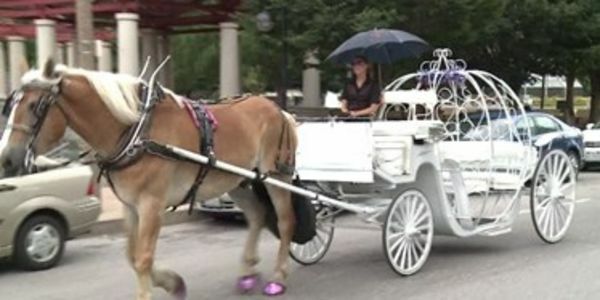 Ban the inhumane and dangerous use of horse carriages in St. Louis, MO. One company has already been banned for having unlicensed drivers and endangering horses, and one company remains. We need to completely ban horse carriages in St. Louis, MO. Here are some links to horrific events and conditions of horses caused by horse-drawn carriages in other US cities. Those could have happened in St. Louis, but either way they shouldn't be happening at all. We need to stop this cruel treatment worldwide, one city at a time! Please sign this petition to help end the sick usage of horse carriages in St. Louis, MO today! Our sister city BIRMINGHAM, AL needs our support. Let's stop the cruel Carriage rides in Birmingham before they get started. While you are signing for Alabama please remember to share this St. Louis Petition. Our goal is 100,00 signatures and we need everyone to help! We are getting stronger and we have a louder voice to save the animals! St. Louis needs your support! We are forming a wider group of sister cities to share our message of humane treatment for horse carriages in St. Louis. Stay tuned for an update with information to share. We can reach our goal of 100,00 signatures. Your comments are very important. Sign and share!